What’s in a name? Rabbi Naftali Brawer considers the naming and not-naming of God. He explains how the names he has used for God have charted his own spiritual journey, and suggests a surprising interpretation of the very first words of the Bible. There are many names of God in the Jewish tradition, expressing different aspects of the Creator. Rabbi Brawer takes a look at these, along with the key passage from the Book of Exodus in which Moses asks God for his name. 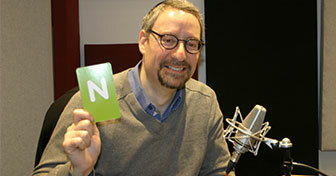 Naftali Brawer is the CEO of the Spiritual Capital Foundation. He was ordained as an Orthodox Rabbi at the age of 22, and for 20 years he served as the spiritual leader of congregations in both the United States and Britain. The A-Z of Things Unseen features a different speaker for each letter of the alphabet, all reflecting on their chosen theme from some kind of faith perspective. A very articulate and illuminating meditation…..